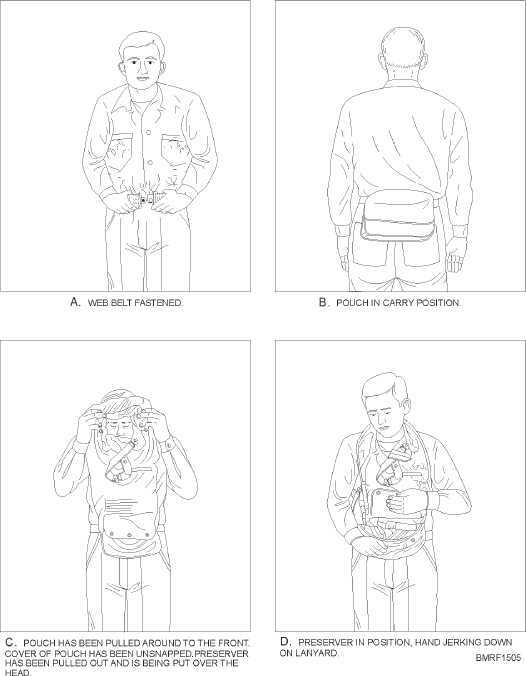 CARE AND STOWAGE OF PRESERVERS. covering in which the fibrous glass pads are wrapped. Attach the light to the inflatable preserver to the tab provided for this purpose. Some ships may issue strobe lights. These lights have a brighter intensity. The battery screws in and is water-resistant. Some commands are issuing chemical lights as life vest pin-on lights. The light used for a pin-on light has a green color when the chemical is activated. You activate the chemical light by squeezing the lens, which crushes 15-7 Student Notes: Figure 15-5.Inflatable life preserver.